Faster Olympic Trials Standards: Yay or Nay? Last week, the USATF made news when they announced a new set of Olympic marathon qualifying standards for both men and women. To qualify for the 2016 trials race, men will have to run a ‘B’ standard time of 2:18 and women will have to run a ‘B’ standard of at least 2:43. The ‘A’ standard time for both men and women has also been decreased, to 2:15 for men and 2:37 for women. The logic given for this decision is to increase the level of athleticism and competitiveness in the trials race, which is backed up by the increase in runners (both men and women) from 2008 to 2012, despite a tightening of standards between those two Olympic years as well. On one hand, this decision makes perfect sense. If more runners are qualifying on tighter standards, then why not bring them down by another few minutes? 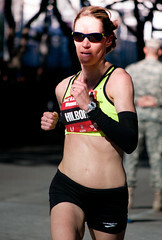 Besides, the changes made are small: the women’s ‘B’ standard time for 2016 is three minutes faster than it was in 2012 and the men’s time is only one minute faster – far less then the controversial 5-minute tightening of Boston marathon qualifying standards recently undertaken by the BAA for ostensibly the same reasons. Additionally, this brings the US qualifying standards in line with the International Association of Athletics Federations, the governing entity that sets the standards for Olympic participation. For example, a woman seeking to run a 10,000m race at the Olympics for any nation must have a PR of 31:45:00 or better (whoa). If we, as a country, want our athletes to not only meet world standards, but to win gold medals, why wouldn’t our standards match those of the IAAF? Especially when we know that we have runners than can beat those times? For those of us who will never, even in our dreams, run anything even approaching the Olympic qualifying standards, the above logic makes perfect sense. Additionally, the runners that have the best chance of going to the Olympics regularly beat even the ‘A’ standard by a wide margin, so this change won’t affect them much either. However, there’s another group of runners right in the middle, and those are the runners whose end goal is simply to run in the trials race. Every four years, hundreds of runners toe the start line of the Olympic trials marathon, even though only 5 or 6 runners will actually get to race in the Olympic event. Most of these runners are perfectly realistic about the fact that they have very little chance of winning the trials event, which is fine because that was never their goal. Their goal was simply to qualify. In a way, the trials race is like a quadrennial Boston for the super-speedy: a race that they have to earn their way into, for which getting to go is enough reward in and of itself. For these runners, the change is a big deal. The faster you are, the harder it is to cut time from your PRs. Someone who runs 30 minutes in a 5k could realistically expect to shave several minutes off their time with training. Someone who runs 17 minutes for that same race? It would be a struggle to improve their time by seconds. So it is with the marathon. Decreasing the ‘B’ standard by 3 minutes may take it from ‘within the realm of possibility’ to ‘completely out of the question, discouraging countless runners from even making the effort to qualify. Fifth place finisher in the 2008 trials, Tera Moody, has a great blog post from the perspective of a runner on the cusp of Olympian status. No matter how you look at it, this change affects a very small number of people. Do you think the USATF is right in continuing to “raise the bar” and encourage our elite athletes to strive for better performances? Or should they be thinking about the sport of marathoning in a wider sense and keep the Olympic trials race something that all sub-elite runners feel like they can shoot for? In short, is this change a good thing? I think it’s a good move. The U.S. can’t ever expect to “catch up” to the rest of the world in marathoning if we don’t expect more of our athletes. And while it IS hard to shave time once you reach these super speedy times, it’s proven that people raise their game, somehow, when the expectations are higher. I give it a thumb’s up! I’m someone who feels like I’m on the bubble to go for an OTQ, talent-wise. I think with more marathon experience and more than one year of training at a time that I could go for it with a straight face. The raising of the standards doesn’t really do much to change whether I will go for it or not. It definitely makes it much less likely I’ll make it, but for someone like me I’m not sure it was ever very likely that I would. I’ll be at least 38 by the time I run my next marathon and I’m limited in my ability to train to what time my family can spare for me. For me, whether the standard is 2:46, 2:43 or even 2:50 it would be a huge leap of faith for me to pursuit it. 3 minutes IS a lot at this level, but at the same time I doubt it’s enough to discourage most people who would be interested in going for it, from going for it. I was worried they’d make the B standard 2:40. For some reason that seems way more daunting than 2:43! It’s all a matter of time. And your time is coming, I have no doubt. Patience, grasshopper. As for me, I waaaas gonna try to go for it, but those extra 3 minutes dashed all my hopes and dreams of an OTQ. Heheh. Seriously though, I’d need either a 45 minute head start or a bicycle to finish 26.2 that fast!